I know I went all nuts on y’all and said I was NOT going to bring my kids to ACL this year. I stick by what I said, that there are easier ways to see live music with your kids, but if you have an adult ticket anyway, and you have really great in-laws in town who can pick the kids up about mid-afternoon, then why not? 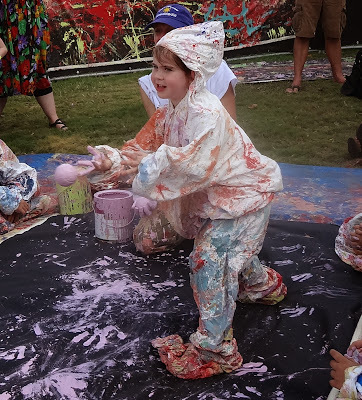 ACL’s Austin Kiddie Limits has kids activities like rock-star hairdos, temporary tattoos, video karaoke and different ways to get messy with paint. That is Buttercup above, at the Abrakadoodle art+play activity, which might just be the art+play at her next birthday party. Rosetta Stone at ACL? Aren’t they the folks who do language lessons on CD in big yellow boxes for $500? And, do CDs still exist? Well, I talked with Jonathan Mudd, Director of Global Communications and Paul Weaver, Senior Director of Product Content at Rosetta Stone. They said Rosetta Stone still makes the CDs in the big yellow boxes, but they also make mobile apps for kids and adults. They are leveraging the language theory and speech recognition engine that they have perfected over the years and merged that with the latest in mobile technology and game design. Their first offering for kids is “Kids Lingo Letter Sounds” which helps English-speaking kids ages 4-5-years-old learn Spanish. 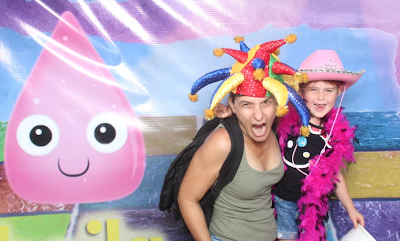 Cute characters tell a story and the kids speak Spanish to move the action along. My kids like that they get to talk, they don’t just passively watch the screen. I like that it is based on a story, so it keeps their attention. Both our girls either are now, or have been, in Spanish immersion classes at their elementary school. Now they can practice what they learn at school by playing a game. The game does need more words and it would be good to have options for other ages. Hopefully that will come in time. For now, Sparkles and Buttercup have both given it a thumbs-up! But what about us grown-ups? Rosetta also has a number of Travel apps for any age, so you can practice transportation, restaurant and “Donde esta el bano? when you are on a trip. Since it will be a while (maybe when the kids are grown?) before I can learn all of Spanish, this is a fun place to start. The music at Austin Kiddie Limits was pretty good and I doesn’t usually like music made for kids. My favorites were Tim and the Space Cadets with Mother Falcon and Play Date. There was also shade and lots of room for dancing, which is pretty sweet. That’s all for this year from Austin Kiddie Limits. 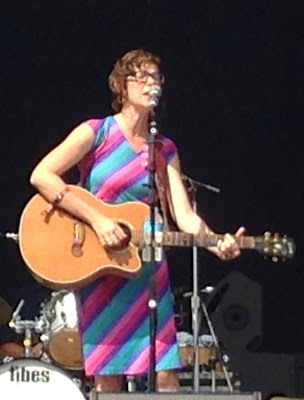 Stay tuned for a few more posts, the last of the Parenting Advice from ACL Musicians series, and an overall ACL wrap-up.